We are able to buy Jerith Aluminum Fence straight from the manufacture in such quantities that we get ridiculous, out of this world discounts. Our goal at Discount Fence Supply, Inc. is to pass on those discounts to our customers so that they can buy top quality aluminum fence at wholesale prices. 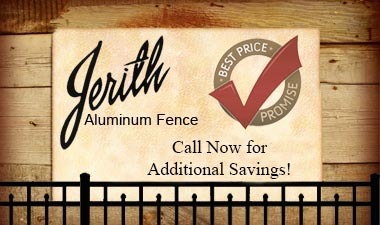 The current promotion is 12% off our online advertised prices on Jerith aluminum fence. Now what does that mean? That means that you get to take an additional 12% off the price that you calculate in your shopping cart (before shipping). Orders must be $1,000.00 or more to receive extra discount. A lot of orders qualify for free shipping, and you will never know if yours qualifies unless you give us a call 1.330.650.9226! We strive to keep our prices the lowest on the internet for aluminum fence, and if you receive a quote from one of our trusty competitors and it beats our price, we would love the chance to get you a better price. Now remember, it must be the same type of fence, an apples for apples comparison.